"Brezhnev" redirects here. For other uses, see Brezhnev (disambiguation). This name uses Eastern Slavic naming customs; the patronymic is Ilyich and the family name is Brezhnev. Leonid Ilyich Brezhnev (/ˈbrɛʒnɛf/; Russian: Леони́д Ильи́ч Бре́жнев, IPA: [lʲɪɐˈnʲid ɪˈlʲjidʑ ˈbrʲeʐnʲɪf] ( listen); Ukrainian: Леоні́д Іллі́ч Бре́жнєв, 19 December 1906 (O.S. 6 December) – 10 November 1982) was a Soviet politician. The fifth leader of the Soviet Union, he was General Secretary of the Central Committee of the governing Communist Party of the Soviet Union (CPSU) from 1964 until his death in 1982. Ideologically, he was a Marxist-Leninist. He presided over the Soviet's greatest involvement in world affairs, including détente with the West. But he also increasingly confronted the Sino-Soviet split, which divided and weakened communist parties across the world. His invasion of Afghanistan in 1979 and détente, and damaged Moscow's reputation around the globe. In domestic affairs, he presided over a steady decline in the economy, marked by corruption, inefficiency, and rapidly widening weakness in technological advances, especially computers. Nevertheless he was a force for political stability inside the Kremlin, maintaining his power despite his rapidly declining health after 1975. Brezhnev was born to a Russian worker's family in Kamenskoye in the Russian Empire (now Ukraine). After graduating from the Kamenskoye Metallurgical Technicum, he became a metallurgical engineer in the iron and steel industry. After the October Revolution led to the formation of a one-party state led by the Communist Party, Brezhnev joined the party's youth league, Komsomol, in 1923, and then became an active party member by 1929. With the invasion by Germany in 1941, he joined the Army and held increasingly important political posts as the Communist Party closely monitored the generals. After the war he rose steadily in the top ranks of the party, and became a protégé of Joseph Stalin. In 1952 Brezhnev was promoted to the Central Committee and in 1957 to full member of the Politburo. In 1964, he ousted Nikita Khrushchev and took over as First Secretary of the CPSU, the most powerful position in the Kremlin. As the leader of the Soviet Union, Brezhnev's conservatism and carefulness to reach decisions through consensus within the Politburo resulted in sustained political stability within the party and the country. On the world stage, Brezhnev pushed hard for the adoption of détente to relax tensions and foster economic cooperation between the two Cold War superpowers. Brezhnev's health rapidly deteriorated after 1975 and he increasingly withdrew from international affairs. Détente finally collapsed after Brezhnev ordered the invasion of Afghanistan in 1979. The widespread response of boycotting the Moscow Olympics of 1980 was a bitter humiliation. Brezhnev's hostility towards reform. and tolerance of corruption ushered in a period of socioeconomic decline known as the Brezhnev Stagnation. His regime presided over widespread military interventionism and a massive arms buildup that ultimately grew to comprise 12.5% of the nation's GNP. In terms of technology, especially computers, the Soviet Union fell further and further behind the West. After years of declining health, Brezhnev died on 10 November 1982 and was quickly succeeded as General Secretary by Yuri Andropov. Upon coming to power in 1985, Mikhail Gorbachev denounced the Brezhnev regime's pervasive inefficiency and inflexibility before overseeing steps to liberalize the Soviet Union. Brezhnev's eighteen-year term as General Secretary was second only to that of Joseph Stalin in duration. During Brezhnev's rule, the global influence of the Soviet Union grew dramatically, in part because of the expansion of its military during this time. His tenure as leader was also marked by the beginning of an era of economic and social stagnation in the Soviet Union. Brezhnev was born on 19 December 1906 in Kamenskoye, Yekaterinoslav Governorate, Russian Empire (now Kamianske, Ukraine), to metalworker Ilya Yakovlevich Brezhnev and his wife, Natalia Denisovna Mazalova. His parents used to live in Brezhnevo (Kursky District, Kursk Oblast, Russia) before moving to Kamenskoe. Brezhnev's ethnicity was specified as Ukrainian in main documents including his passport, and Russian in some others. Like many youths in the years after the Russian Revolution of 1917, he received a technical education, at first in land management and then in metallurgy. He graduated from the Kamenskoye Metallurgical Technicum in 1935 and became a metallurgical engineer in the iron and steel industries of eastern Ukraine. Brezhnev joined the Communist Party youth organisation, the Komsomol, in 1923, and the Party itself in 1929. In 1935 and 1936, Brezhnev served his compulsory military service, and after taking courses at a tank school, he served as a political commissar in a tank factory. Later in 1936, he became director of the Dniprodzerzhynsk Metallurgical Technicum (technical college) (in 1936 Brezhnev hometown Kamenskoye was renamed to Dniprodzerzhynsk). In 1936, he was transferred to the regional center of Dnipropetrovsk, and in 1939, he became Party Secretary in Dnipropetrovsk, in charge of the city's important defence industries. As a survivor of Stalin's Great Purge of 1937–39, he was able to advance quickly as the purges created numerous openings in the senior and middle ranks of the Party and state governments. Brigade commissar Brezhnev (right) presents a Communist Party membership card to a soldier on the Eastern Front in 1943. When Nazi Germany invaded the Soviet Union on 22 June 1941, Brezhnev was, like most middle-ranking Party officials, immediately drafted. He worked to evacuate Dnipropetrovsk's industries to the east of the Soviet Union before the city fell to the Germans on 26 August, and then was assigned as a political commissar. In October, Brezhnev was made deputy of political administration for the Southern Front, with the rank of Brigade-Commissar (Colonel). When Ukraine was occupied by the Germans in 1942, Brezhnev was sent to the Caucasus as deputy head of political administration of the Transcaucasian Front. In April 1943, he became head of the Political Department of the 18th Army. Later that year, the 18th Army became part of the 1st Ukrainian Front, as the Red Army regained the initiative and advanced westward through Ukraine. The Front's senior political commissar was Nikita Khrushchev, who had supported Brezhnev's career since the pre-war years. Brezhnev had met Khrushchev in 1931, shortly after joining the Party, and before long, as he continued his rise through the ranks, he became Khrushchev's protégé. At the end of the war in Europe, Brezhnev was chief political commissar of the 4th Ukrainian Front, which entered Prague in May 1945, after the German surrender. Brezhnev temporarily left the Soviet Army with the rank of Major General in August 1946. He had spent the entire war as a political commissar rather than a military commander. After working on reconstruction projects in Ukraine, he again became General Secretary in Dnipropetrovsk. In 1950, he became a deputy of the Supreme Soviet of the Soviet Union, the Soviet Union's highest legislative body. Later that year he was appointed Party First Secretary of Communist Party of Moldova in the Moldavian SSR. In 1952, he had a meeting with Stalin after which Stalin promoted Brezhnev to the Communist Party's Central Committee as a candidate member of the Presidium (formerly the Politburo). Stalin died in March 1953, and in the reorganization that followed, he was demoted to first deputy head of the political directorate of the Army and Navy. Nikita Khrushchev, leader of the Soviet Union from 1955 to 1964 and Brezhnev's main patron. Brezhnev's patron Khrushchev succeeded Stalin as General Secretary, while Khrushchev's opponent Georgy Malenkov succeeded Stalin as Chairman of the Council of Ministers. Brezhnev sided with Khrushchev against Malenkov, but only for several years. On 7 May 1955, Brezhnev was made General Secretary of the Communist Party of the Kazakh SSR. On the surface, his brief was simple: to make the new lands agriculturally productive. In reality, Brezhnev became involved in the development of the Soviet missile and nuclear arms programs, including the Baykonur Cosmodrome. The initially successful Virgin Lands Campaign soon became unproductive and failed to solve the growing Soviet food crisis. Brezhnev was recalled to Moscow in 1956. The harvest in the years following the Virgin Lands Campaign was disappointing, which would have hurt his political career had he remained in Kazakhstan. In February 1956, Brezhnev returned to Moscow, was made candidate member of the Politburo assigned in control of the defence industry, the space program including the Baykonur Cosmodrome, heavy industry, and capital construction. He was now a senior member of Khrushchev's entourage, and in June 1957, he backed Khrushchev in his struggle with Malenkov's Stalinist old guard in the Party leadership, the so-called "Anti-Party Group". Following the defeat of the Stalinist's, Brezhnev became a full member of the Politburo. Brezhnev became Second Secretary of the Central Committee in 1959, and in May 1960 was promoted to the post of Chairman of the Presidium of the Supreme Soviet, making him the nominal head of state, although the real power resided with Khrushchev as First Secretary of the Soviet Communist Party. Until about 1962, Khrushchev's position as Party leader was secure; but as the leader aged, he grew more erratic and his performance undermined the confidence of his fellow leaders. The Soviet Union's mounting economic problems also increased the pressure on Khrushchev's leadership. Outwardly, Brezhnev remained loyal to Khrushchev, but became involved in a 1963 plot to remove the leader from power, possibly playing a leading role. Also in 1963, Brezhnev succeeded Frol Kozlov, another Khrushchev protégé, as Secretary of the Central Committee, positioning him as Khrushchev's likely successor. Khrushchev made him Second Secretary, literally deputy party leader, in 1964. Brezhnev (center) partaking in a hunting outing with Khrushchev (far left) in 1963, one year before the latter's ousting. After returning from Scandinavia and Czechoslovakia in October 1964, Khrushchev, unaware of the plot, went on holiday in Pitsunda resort on the Black Sea. Upon his return, his Presidium officers congratulated him for his work in office. Anastas Mikoyan visited Khrushchev, hinting that he should not be too complacent about his present situation. Vladimir Semichastny, head of the KGB, was a crucial part of the conspiracy, as it was his duty to inform Khrushchev if anyone was plotting against his leadership. Nikolay Ignatov, who had been sacked by Khrushchev, discreetly requested the opinion of several Central Committee members. After some false starts, fellow conspirator Mikhail Suslov phoned Khrushchev on 12 October and requested that he return to Moscow to discuss the state of Soviet agriculture. Finally Khrushchev understood what was happening, and said to Mikoyan, "If it's me who is the question, I will not make a fight of it." While a minority headed by Mikoyan wanted to remove Khrushchev from the office of First Secretary but retain him as the Chairman of the Council of Ministers, the majority, headed by Brezhnev, wanted to remove him from active politics altogether. Brezhnev and Nikolai Podgorny appealed to the Central Committee, blaming Khrushchev for economic failures, and accusing him of voluntarism and immodest behavior. Influenced by Brezhnev's allies, Politburo members voted on 14 October to remove Khrushchev from office. In addition, some members of the Central Committee wanted him to undergo punishment of some kind. But Brezhnev, who had already been assured the office of the General Secretary, saw little reason to punish his old mentor further. Brezhnev was appointed First Secretary on the same day, but at the time was believed to be a transition leader of sorts, who would only "keep the shop" until another leader was appointed. Alexei Kosygin was appointed head of government, and Mikoyan was retained as head of state. Brezhnev and his companions supported the general party line taken after Joseph Stalin's death, but felt that Khrushchev's reforms had removed much of the Soviet Union's stability. One reason for Khrushchev's ousting was that he continually overruled other party members, and was, according to the plotters, "in contempt of the party's collective ideals". Pravda, a newspaper in the Soviet Union, wrote of new enduring themes such as collective leadership, scientific planning, consultation with experts, organisational regularity and the ending of schemes. When Khrushchev left the public spotlight, there was no popular commotion, as most Soviet citizens, including the intelligentsia, anticipated a period of stabilization, steady development of Soviet society and continuing economic growth in the years ahead. Political scientist George W. Breslauer has compared Khrushchev and Brezhnev as leaders. He argues they took different routes to build legitimate authority, depending on their personalities and the state of public opinion. Khrushchev worked to decentralize the government system, and empower local leadership, which had been wholly subservient in style and stay. On the other hand, Brezhnev sought to centralize authority, going so far as to weaken the roles of the other members of the Central Committee and the Politburo. Upon replacing Khrushchev as the party's First Secretary, Brezhnev became the de jure supreme authority in the Soviet Union. However, he was initially forced to govern as part of a troika alongside the country's Premier, Alexei Kosygin, as well as the party's Second Secretary and later Chairman of the Presidium of the Supreme Soviet, Nikolai Podgorny. Due to Khrushchev’s disregard for the rest of the Politburo upon combining his leadership of the party with that of the Soviet government, a plenum of the Central Committee in October 1964 forbade any single individual from holding both the offices of General Secretary and Premier. This arrangement would persist until the 1970s when Brezhnev consolidated his grip on power to become the dominant figure in the Soviet Union. Former Chairman of the State Committee for State Security (KGB) Alexander Shelepin disliked the new collective leadership and its reforms. He made a bid for the supreme leadership in 1965 by calling for the restoration of "obedience and order". Shelepin failed to gather support in the Presidium and Brezhnev's position was fairly secure; he was able to remove Shelepin from office in 1967. Brezhnev meets U.S. President Gerald Ford at the Vladivostok Summit in 1974 after securing his position as leader of the USSR. T.H. Rigby argued that by the end of the 1960s, a stable oligarchic system had emerged in the Soviet Union, with most power vested around Brezhnev, Kosygin and Podgorny. While the assessment was true at the time, it coincided with Brezhnev's strengthening of power by means of an apparent clash with Central Committee Secretariat Mikhail Suslov. American Henry A. Kissinger, in the 1960s, mistakenly believed Kosygin to be the dominant leader of Soviet foreign policy in the Politburo. During this period, Brezhnev was gathering enough support to strengthen his position within Soviet politics. In the meantime, Kosygin was in charge of economic administration in his role as Chairman of the Council of Ministers. Kosygin's position was weakened when he proposed an economic reform in 1965, which was widely referred to as the "Kosygin reform" within the Communist Party. The reform led to a backlash, and party old guard continued to oppose Kosygin after witnessing the results of reforms leading up to the Prague Spring. His opponents then flocked to Brezhnev, and they helped him in his task of strengthening his position within the Soviet system. Brezhnev was adept at politics within the Soviet power structure. He was a team player and never acted rashly or hastily; unlike Khrushchev, he did not make decisions without substantial consultation from his colleagues, and was always willing to hear their opinions. During the early 1970s, Brezhnev consolidated his domestic position. In 1977, he forced the retirement of Podgorny and became once again Chairman of the Presidium of the Supreme Soviet of the Soviet Union, making this position equivalent to that of an executive president. 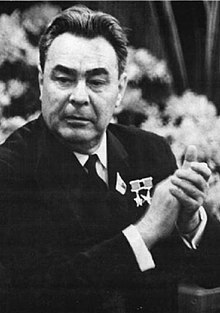 While Kosygin remained Premier until shortly before his death in 1980 (replaced by Nikolai Tikhonov as Premier), Brezhnev was the dominant driving force of the Soviet Union from the mid-1970s to his death in 1982. Yuri Andropov, the Chairman of the KGB who presided over the pervasive crackdown on dissent during Brezhnev's leadership. Brezhnev's stabilization policy included ending the liberalizing reforms of Khrushchev, and clamping down on cultural freedom. During the Khrushchev years, Brezhnev had supported the leader's denunciations of Stalin's arbitrary rule, the rehabilitation of many of the victims of Stalin's purges, and the cautious liberalization of Soviet intellectual and cultural policy. But as soon as he became leader, Brezhnev began to reverse this process, and developed an increasingly totalitarian and regressive attitude. The trial of the writers Yuli Daniel and Andrei Sinyavsky in 1966—the first such public trials since Stalin's day—marked the reversion to a repressive cultural policy. 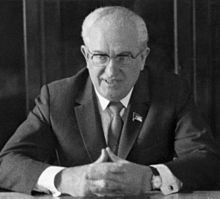 Under Yuri Andropov the state security service (in the form of the KGB) regained some of the powers it had enjoyed under Stalin, although there was no return to the purges of the 1930s and 1940s, and Stalin's legacy remained largely discredited among the Soviet intelligentsia. By the mid-1970s, there were an estimated 1,000  to 10,000 political and religious prisoners across the Soviet Union, living in grievous conditions and suffering from malnutrition. Many of these prisoners were considered by the Soviet state to be mentally unfit and were hospitalized in mental asylums across the Soviet Union. Under Brezhnev's rule, the KGB infiltrated most, if not all, anti-government organisations, which ensured that there was little to no opposition against him or his power base. However, Brezhnev refrained from the all-out violence seen under Stalin's rule. Between 1960 and 1970, Soviet agriculture output increased by 3% annually. Industry also improved: during the Eighth Five-Year Plan (1966–1970), the output of factories and mines increased by 138% compared to 1960. While the Politburo became aggressively anti-reformist, Kosygin was able to convince both Brezhnev and the politburo to leave the reformist communist leader János Kádár of the People's Republic of Hungary alone because of an economic reform entitled New Economic Mechanism (NEM), which granted limited permission for the establishment of retail markets. In the People's Republic of Poland, another approach was taken in 1970 under the leadership of Edward Gierek; he believed that the government needed Western loans to facilitate the rapid growth of heavy industry. The Soviet leadership gave its approval for this, as the Soviet Union could not afford to maintain its massive subsidy for the Eastern Bloc in the form of cheap oil and gas exports. The Soviet Union did not accept all kinds of reforms, an example being the Warsaw Pact invasion of Czechoslovakia in 1968 in response to Alexander Dubček's reforms. Under Brezhnev, the Politburo abandoned Khrushchev's decentralization experiments. By 1966, two years after taking power, Brezhnev abolished the Regional Economic Councils, which were organized to manage the regional economies of the Soviet Union. The Ninth Five-Year Plan delivered a change: for the first time industrial consumer products out-produced industrial capital goods. Consumer goods such as watches, furniture and radios were produced in abundance. The plan still left the bulk of the state's investment in industrial capital-goods production. This outcome was not seen as a positive sign for the future of the Soviet state by the majority of top party functionaries within the government; by 1975 consumer goods were expanding 9% slower than industrial capital-goods. The policy continued despite Brezhnev's commitment to make a rapid shift of investment to satisfy Soviet consumers and lead to an even higher standard of living. This did not happen. During 1928–1973, the Soviet Union was growing economically at a pace that would eventually catch up with the United States and Western Europe. However, objective comparisons are difficult. The USSR was hampered by the effects of World War II, which had left most of Western USSR in ruins, however Western aid and Soviet espionage in the period 1941–1945 (culminating in cash, material and equipment deliveries for military and industrial purposes) had allowed the Russians to leapfrog many Western economies in the development of advanced technologies, particularly in the fields of nuclear technology, radio communications, agriculture and heavy manufacturing. In 1973, the process of catching up with the rest of the West came to an abrupt end, and 1973 was seen by some scholars as the start of the Era of Stagnation. The beginning of the stagnation coincided with a financial crisis in Western Europe and the U.S. By the early 1970s, the Soviet Union had the world's second largest industrial capacity, and produced more steel, oil, pig-iron, cement and tractors than any other country. Before 1973, the Soviet economy was expanding at a faster rate than that of the American economy (albeit by a very small margin). The USSR also kept a steady pace with the economies of Western Europe. Between 1964 and 1973, the Soviet economy stood at roughly half the output per head of Western Europe and a little more than one third that of the U.S.
Brezhnev's agricultural policy reinforced the conventional methods for organizing the collective farms. Output quotas continued to be imposed centrally. Khrushchev's policy of amalgamating farms was continued by Brezhnev, because he shared Khrushchev's belief that bigger kolkhozes would increase productivity. Brezhnev pushed for an increase in state investments in farming, which mounted to an all-time high in the 1970s of 27% of all state investment – this figure did not include investments in farm equipment. In 1981 alone, 33 billion U.S. dollars (by contemporary exchange rate) was invested into agriculture. Agricultural output in 1980 was 21% higher than the average production rate between 1966 and 1970. Cereal crop output increased by 18%. These improved results were not encouraging. In the Soviet Union the criterion for assessing agricultural output was the grain harvest. The import of cereal, which began under Khrushchev, had in fact become a normal phenomenon by Soviet standards. When Brezhnev had difficulties sealing commercial trade agreements with the United States, he went elsewhere, such as to Argentina. Trade was necessary because the Soviet Union's domestic production of fodder crops was severely deficient. Another sector that was hitting the wall was the sugar beet harvest, which had declined by 2% in the 1970s. Brezhnev's way of resolving these issues was to increase state investment. Politburo member Gennady Voronov advocated for the division of each farm's work-force into what he called "links". These "links" would be entrusted with specific functions, such as to run a farm's dairy unit. His argument was that the larger the work force, the less responsible they felt. This program had been proposed to Joseph Stalin by Andrey Andreyev in the 1940s, and had been opposed by Khrushchev before and after Stalin's death. Voronov was also unsuccessful; Brezhnev turned him down, and in 1973 he was removed from the Politburo. Experimentation with "links" was not disallowed on a local basis, with Mikhail Gorbachev, the then First Secretary of the Stavropol Regional Committee, experimenting with links in his region. In the meantime, the Soviet government's involvement in agriculture was, according to Robert Service, otherwise "unimaginative" and "incompetent". Facing mounting problems with agriculture, the Politburo issued a resolution titled, "On the Further Development of Specialisation and Concentration of Agricultural Production on the Basis of Inter-Farm Co-operation and Agro-Industrial Integration". The resolution ordered kolkhozes close to each other to collaborate in their efforts to increase production. In the meantime, the state's subsidies to the food-and-agriculture sector did not prevent bankrupt farms from operating: rises in the price of produce were offset by rises in the cost of oil and other resources. By 1977, oil cost 84% more than it did in the late 1960s. The cost of other resources had also climbed by the late 1970s. Brezhnev's answer to these problems was to issue two decrees, one in 1977 and one in 1981, which called for an increase in the maximum size of privately owned plots within the Soviet Union to half a hectare. These measures removed important obstacles for the expansion of agricultural output, but did not solve the problem. Under Brezhnev, private plots yielded 30% of the national agricultural production when they only cultivated 4% of the land. This was seen by some as proof that de-collectivization was necessary to prevent Soviet agriculture from collapsing, but leading Soviet politicians shrank from supporting such drastic measures due to ideological and political interests. The underlying problems were the growing shortage of skilled workers, a wrecked rural culture, the payment of workers in proportion to the quantity rather than the quality of their work, and too large farm machinery for the small collective farms and the roadless countryside. In the face of this, Brezhnev's only options were schemes such as large land reclamation and irrigation projects, or of course, radical reform. The Era of Stagnation, a term coined by Mikhail Gorbachev, was seen as the result of a compilation of factors, including the ongoing "arms race" between the two superpowers, the Soviet Union and the United States; the decision of the Soviet Union to participate in international trade (thus abandoning the idea of economic isolation) while ignoring the changes occurring in Western societies; the increasing harshness of its policies, such as sending Soviet tanks to crush the Prague Spring in 1968; the intervention in Afghanistan; the stifling domestic bureaucracy overseen by a cadre of elderly men; the lack of economic reform; the political corruption, supply bottlenecks, and other unaddressed structural problems with the economy under Brezhnev's rule. Social stagnation domestically was stimulated by the growing demands of unskilled workers, labor shortages and a decline in productivity and labor discipline. While Brezhnev, albeit "sporadically", through Alexei Kosygin, attempted to reform the economy in the late 1960s and 1970s, he ultimately failed to produce any positive results. One of these reforms was the economic reform of 1965, initiated by Kosygin, though its origins are often traced back to the Khrushchev Era. The reform was cancelled by the Central Committee, though the Committee admitted that economic problems did exist. In 1973, the Soviet economy slowed, and began to lag behind that of the West due to the high level of expenditure on the armed forces and too little spending on light industry and consumer goods. Soviet agriculture could not feed the urban population, let alone provide for the rising standard of living, which the government promised as the fruits of "mature socialism", and on which industrial productivity depended. One of the most prominent critics of Brezhnev's economical policies was Mikhail Gorbachev who, when leader, called the economy under Brezhnev's rule "the lowest stage of socialism". Soviet GNP growth rates began to decrease in the 1970s from the level it held in the 1950s and 1960s; its growth rates began to lag behind Western Europe and the United States. The GNP growth rate was slowing to 1% to 2% per year, and with Soviet technology falling ever farther behind that of the West, the Soviet Union was facing economic stagnation by the early 1980s. During Brezhnev's last years in power, the CIA monitored the Soviet Union's economic growth, and reported that the Soviet economy peaked in the 1970s, calculating that it had then reached 57% of the American GNP. The development gap between the two nations widened, with the United States growing an average of 1% per year above the growth rate of the Soviet Union. The last significant reform undertaken by the Kosygin government, and some believe the pre-perestroika era, was a joint decision of the Central Committee and the Council of Ministers named "Improving planning and reinforcing the effects of the economic mechanism on raising the effectiveness in production and improving the quality of work", more commonly known as the 1979 reform. The reform, in contrast to the 1965 reform, sought to increase the central government's economic involvement by enhancing the duties and responsibilities of the ministries. With Kosygin's death in 1980, and due to his successor Nikolai Tikhonov's conservative approach to economics, very little of the reform was actually carried out. The Eleventh Five-Year Plan of the Soviet Union delivered a disappointing result: a change in growth from 5 to 4%. During the earlier Tenth Five-Year Plan, they had tried to meet the target of 6.1% growth, but failed. Brezhnev was able to defer economic collapse by trading with Western Europe and the Arab World. The Soviet Union still out-produced the United States in the heavy industry sector during the Brezhnev era. Another dramatic result of Brezhnev's rule was that certain Eastern Bloc countries became more economically advanced than the Soviet Union. Over the eighteen years that Brezhnev ruled the Soviet Union, average income per head increased by half; three-quarters of this growth came in the 1960s and early 1970s. During the second half of Brezhnev's reign, average income per head grew by one-quarter. In the first half of the Brezhnev period, income per head increased by 3.5% per annum; slightly less growth than what it had been the previous years. This can be explained by Brezhnev's reversal of most of Khrushchev's policies. Consumption per head rose by an estimated 70% under Brezhnev, but with three-quarters of this growth happening before 1973 and only one-quarter in the second half of his rule. Most of the increase in consumer production in the early Brezhnev era can be attributed to the Kosygin reform. When the USSR's economic growth stalled in the 1970s, the standard of living and housing quality improved significantly. Instead of paying more attention to the economy, the Soviet leadership under Brezhnev tried to improve the living standard in the Soviet Union by extending social benefits. This led to an increase, though a minor one, in public support. The standard of living in the Russian Soviet Federative Socialist Republic (RSFSR) had fallen behind that of the Georgian Soviet Socialist Republic (GSSR) and the Estonian Soviet Socialist Republic (ESSR) under Brezhnev; this led many Russians to believe that the policies of the Soviet Government were hurting the Russian population. The state usually moved workers from one job to another, which ultimately became an ineradicable feature in Soviet industry. Government industries such as factories, mines and offices were staffed by undisciplined personnel who put a great effort into not doing their jobs; this ultimately led, according to Robert Service, to a "work-shy workforce". The Soviet Government had no effective counter-measure; it was extremely difficult, if not impossible to replace ineffective workers because of the country's lack of unemployment. While some areas improved during the Brezhnev era, the majority of civilian services deteriorated and living conditions for Soviet citizens fell rapidly. Diseases were on the rise because of the decaying healthcare system. The living space remained rather small by First World standards, with the average Soviet person living on 13.4 square metres. Thousands of Moscow inhabitants became homeless, most of them living in shacks, doorways and parked trams. Nutrition ceased to improve in the late 1970s, while rationing of staple food products returned to Sverdlovsk for instance. The state provided recreation facilities and annual holidays for hard-working citizens. Soviet trade unions rewarded hard-working members and their families with beach vacations in Crimea and Georgia. Social rigidification became a common feature of Soviet society. During the Stalin era in the 1930s and 1940s, a common labourer could expect promotion to a white-collar job if he studied and obeyed Soviet authorities. In Brezhnev's Soviet Union this was not the case. Holders of attractive positions clung to them as long as possible; mere incompetence was not seen as a good reason to dismiss anyone. In this way, too, the Soviet society Brezhnev passed on had become static. During his eighteen years as Leader of the USSR, Brezhnev's signature foreign policy innovation was the promotion of détente. While sharing some similarities with approaches pursued during the Khrushchev Thaw, Brezhnev's policy significantly differed from Khrushchev's precedent in two ways. The first was that it was more comprehensive and wide-ranging in its aims, and included signing agreements on arms control, crisis prevention, East–West trade, European security and human rights. The second part of the policy was based on the importance of equalizing the military strength of the United States and the Soviet Union. [according to whom?] Defense spending under Brezhnev between 1965 and 1970 increased by 40%, and annual increases continued thereafter. In the year of Brezhnev's death in 1982, 15% of GNP was spent on the military. 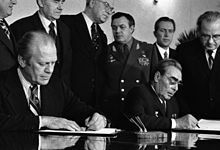 Brezhnev and Ford signing joint communiqué on the SALT treaty in Vladivostok. In the 1970s, the Soviet Union reached the peak of its political and strategic power in relation to the United States. The first SALT Treaty effectively established parity in nuclear weapons between the two superpowers, the Helsinki Treaty legitimized Soviet hegemony over Eastern Europe, and the United States defeat in Vietnam and the Watergate scandal weakened the prestige of the United States. Brezhnev and Nixon also agreed to pass the Anti-Ballistic Missile Treaty, which banned both countries from designing systems that would intercept incoming missiles so that neither the U.S. or the Soviet Union would be tempted to strike the other without the fear of retaliation. The Soviet Union extended its diplomatic and political influence in the Middle East and Africa. During the mid-1970s, it became clear that Henry Kissinger's policy of détente towards the Soviet Union was failing. [according to whom?] The détente had rested on the assumption that a "linkage" of some type could be found between the two countries, with the U.S. hoping that the signing of SALT I and an increase in Soviet–U.S. trade would stop the aggressive growth of communism in the third world. This did not happen,[why?] and the Soviet Union started funding the communist guerillas who fought actively against the U.S. during the Vietnam War. The U.S. ended the Vietnam War in a stalemate and lost Cambodia, Laos and Vietnam to communism. After Gerald Ford lost the presidential election to Jimmy Carter, American foreign policies became more overtly aggressive in vocabulary towards the Soviet Union and the communist world, attempts were also made to stop funding for repressive anti-communist governments and organizations the United States supported. While at first standing for a decrease in all defense initiatives, the later years of Carter's presidency would increase spending on the U.S. military. Nikita Khrushchev had initially supported North Vietnam out of "fraternal solidarity", but as the war escalated he had urged the North Vietnamese leadership to give up the quest of liberating South Vietnam. He continued by rejecting an offer of assistance made by the North Vietnamese government, and instead told them to enter negotiations in the United Nations Security Council. After Khrushchev's ousting, Brezhnev resumed aiding the communist resistance in Vietnam. In February 1965, Kosygin traveled to Hanoi with a dozen Soviet air force generals and economic experts. During the Soviet visit, President Lyndon B. Johnson had authorized U.S. bombing raids on North Vietnamese soil in retaliation for a recent attack by the Viet Cong. Johnson privately suggested to Brezhnev that he would guarantee an end to South Vietnamese hostility if Brezhnev would guarantee a North Vietnamese one. Brezhnev was interested in this offer initially, but after being told by Andrei Gromyko that the North Vietnamese government was not interested in a diplomatic solution to the war, Brezhnev rejected the offer. The Johnson administration responded to this rejection by expanding the American presence in Vietnam, but later invited the USSR to negotiate a treaty concerning arms control. The USSR simply did not respond, initially because Brezhnev and Kosygin were fighting over which of them had the right to represent the USSR abroad, but later because of the escalation of the "dirty war" in Vietnam. In early 1967, Johnson offered to make a deal with Ho Chi Minh, and said he was prepared to end U.S. bombing raids in North Vietnam if Ho ended his infiltration of South Vietnam. The U.S. bombing raids halted for a few days and Kosygin publicly announced his support for this offer. The North Vietnamese government failed to respond, and because of this, the U.S. continued its raids in North Vietnam. The Brezhnev leadership concluded from this event that seeking diplomatic solutions to the ongoing war in Vietnam was hopeless. Later in 1968, Johnson invited Kosygin to the United States to discuss ongoing problems in Vietnam and the arms race. The summit was marked by a friendly atmosphere, but there were no concrete breakthroughs by either side. In the aftermath of the Sino–Soviet border conflict, the Chinese continued to aid the North Vietnamese regime, but with the death of Ho Chi Minh in 1969, China's strongest link to Vietnam was gone. In the meantime, Richard Nixon had been elected President of the United States. While having been known for his anti-communist rhetoric, Nixon said in 1971 that the U.S. "must have relations with Communist China". His plan was for a slow withdrawal of U.S. troops from Vietnam, while still retaining the government of South Vietnam. The only way he thought this was possible was by improving relations with both Communist China and the USSR. He later made a visit to Moscow to negotiate a treaty on arms control and the Vietnam war, but on Vietnam nothing could be agreed. On his visit to Moscow, Nixon and Brezhnev signed the SALT I, marking the beginning of the "détente" era, which would be proclaimed a "new era of peaceful coexistence" that would replace the hostility that existed during the Cold War. Soviet foreign relations with the People's Republic of China quickly deteriorated after Nikita Khrushchev's attempts to reach a rapprochement with more liberal Eastern European states such as Yugoslavia and the west. When Brezhnev consolidated his power base in the 1960s, China was descending into crisis because of Mao Zedong's Cultural Revolution, which led to the decimation of the Communist Party of China and other ruling offices. The Brezhnev leadership who promoted the idea of "stabilization", could not comprehend why Mao would start such a "self-destructive" drive to finish the socialist revolution, according to himself. At the same time, Brezhnev had problems of his own, the Czechoslovakian leadership were also deviating from the Soviet model. In the aftermath of the Soviet invasion of Czechoslovakia, the Soviet leadership proclaimed the Brezhnev doctrine, which said the USSR had the right to intervene in any fraternal communist state that did not follow the Soviet model. This doctrine increased tension not only with the Eastern Bloc, but also the Asian communist states. By 1969 relations with other communist countries had deteriorated to a level where Brezhnev was not even able to gather five of the fourteen ruling communist parties to attend an international conference in Moscow. In the aftermath of the failed conference, the Soviets concluded, "there were no leading center of the international communist movement." Later in 1969, Chinese forces started the Sino–Soviet border conflict. The Sino–Soviet split had chagrined Premier Alexei Kosygin a great deal, and for a while he refused to accept its irrevocability; he briefly visited Beijing in 1969 due to the increase of tension between the USSR and China. By the early 1980s, both the Chinese and the Soviets were issuing statements calling for a normalization of relations between the two states. The conditions given to the Soviets by the Chinese were the reduction of Soviet military presence in the Sino–Soviet border and the withdrawal of Soviets troops in Afghanistan and the Mongolian People's Republic and to end their support for the Vietnamese invasion of Cambodia. Brezhnev responded in his March 1982 speech in Tashkent where he called for the normalization of relations. Full Sino–Soviet normalization of relations would prove to take years, until the last Soviet ruler, Mikhail Gorbachev came to power. After the communist revolution in Afghanistan in 1978, authoritarian actions forced upon the populace by the Communist regime led to the Afghan civil war, with the mujahideen leading the popular backlash against the regime. The Soviet Union was worried that they were losing their influence in Central Asia, so after a KGB report claimed that Afghanistan could be taken in a matter of weeks, Brezhnev and several top party officials agreed to a full intervention. Contemporary researchers tend to believe that Brezhnev had been misinformed on the situation in Afghanistan. His health had decayed, and proponents of direct military intervention took over the majority group in the Politburo by cheating and using falsified evidence. They advocated a relatively moderate scenario, maintaining a cadre of 1,500 to 2,500-men Soviet military advisers and technicians in the country (which had already been there in large numbers since the 1950s), but they disagreed on sending regular army units in hundreds of thousands of troops. Some believe that Brezhnev's signature on the decree was obtained without telling him the full story, otherwise he would have never approved such a decision. Soviet ambassador to the U.S. Anatoly Dobrynin believed that the real mastermind behind the invasion, who misinformed Brezhnev, was Mikhail Suslov. Brezhnev's personal physician Mikhail Kosarev later recalled that Brezhnev, when he was in his right mind, in fact resisted the full-scale intervention. Deputy Chairman of the State Duma Vladimir Zhirinovsky stated officially that despite the military solution being supported by some, hardline Defense Minister Dmitry Ustinov was the only Politburo member who insisted on sending regular army units. Parts of the Soviet military establishment were opposed to any sort of active Soviet military presence in Afghanistan, believing that the Soviet Union should leave Afghan politics alone. President Carter, following the advice of his National Security Adviser Zbigniew Brzezinski, denounced the intervention, describing it as the "most serious danger to peace since 1945". The U.S. stopped all grain exports to the Soviet Union and boycotted the 1980 Summer Olympics held in Moscow. The Soviet Union responded by boycotting the 1984 Summer Olympics held in Los Angeles. A Soviet T-55 tank catches fire while battling Czech protesters during the 1968 invasion of Czechoslovakia. When the situation in Czechoslovakia was discussed with the Politburo, Brezhnev was not the one pushing hardest for the use of military force. Brezhnev was aware of the dire situation he was in, and if he had abstained or voted against Soviet intervention in Czechoslovakia he may have been faced with growing turmoil — domestically and in the Eastern Bloc. Archival evidence suggests that Brezhnev was one of the few who was looking for a temporary compromise with the reform-friendly Czechoslovak government when their relationship was at the brink. Significant voices in the Soviet leadership demanded the re-installation of a so-called 'revolutionary government'. After the military intervention in 1968, Brezhnev met with Czechoslovak reformer Bohumil Simon, then a member of the Politburo of the Czechoslovak Communist Party, and said, "If I had not voted for Soviet armed assistance to Czechoslovakia you would not be sitting here today, but quite possibly I wouldn't either." In 1980 a political crisis emerged in Poland with the emergence of the Solidarity mass movement. By the end of October, Solidarity had 3 million members, and by December, had 9 million. In a public opinion poll organised by the Polish government, 89% of the respondents supported Solidarity. With the Polish leadership split on what to do, the majority did not want to impose martial law, as suggested by Wojciech Jaruzelski. The Soviet Union and the Eastern Bloc was unsure how to handle the situation, but Erich Honecker of East Germany pressed for military action. In a formal letter to Brezhnev, Honecker proposed a joint military measure to control the escalating problems in Poland. A CIA report suggested the Soviet military were mobilizing for an invasion. In 1980–81 representatives from the Eastern Bloc nations met at the Kremlin to discuss the Polish situation. Brezhnev eventually concluded on 10 December 1981 that it would be better to leave the domestic matters of Poland alone, reassuring the Polish delegates that the USSR would intervene only if asked to. This effectively marked the end of the Brezhnev Doctrine. With domestic matters escalating out of control in Poland, Wojciech Jaruzelski imposed a state of war, the Polish version of martial law, on 12 December 1981. Brezhnev's eagerness for undeserved glory was shown by his poorly written memoirs recalling his military service during World War II, which treated the little-known and minor Battle of Novorossiysk as the decisive military theatre. Despite the apparent weaknesses of his book, it was awarded the Lenin Prize for Literature and was hailed with critical acclaim by the Soviet press. The book was followed by two other books, one on the Virgin Lands Campaign. Brezhnev's vanity made him the target of many political jokes. Nikolai Podgorny warned him of this, but Brezhnev replied, "If they are poking fun at me, it means they like me." In keeping with traditional socialist greetings, Brezhnev kissed many politicians during his career, the most memorable instance being the Erich Honecker kiss. Brezhnev's personality cult was growing outrageously at a time when his health was in rapid decline. His physical condition was deteriorating; he had been a heavy smoker until the 1970s, had become addicted to sleeping pills, and had begun drinking to excess. Over the years he had become overweight. From 1973 until his death, Brezhnev's central nervous system underwent chronic deterioration and he had several minor strokes as well as insomnia. In 1975 he suffered his first heart attack. When receiving the Order of Lenin, Brezhnev walked shakily and fumbled his words. According to one American intelligence expert, United States officials knew for several years that Brezhnev had suffered from severe arteriosclerosis and believed he had suffered from other unspecified ailments as well. In 1977 American intelligence officials publicly suggested that Brezhnev had also been suffering from gout, leukemia and emphysema from decades of heavy smoking, as well as chronic bronchitis. He was reported to have been fitted with a pacemaker to control his heart rhythm abnormalities. On occasion, he was known to have suffered from memory loss, speaking problems and had difficulties with co-ordination. According to the Washington Post, "All of this is also reported to be taking its toll on Brezhnev's mood. He is said to be depressed, despondent over his own failing health and discouraged by the death of many of his long-time colleagues. To help, he has turned to regular counseling and hypnosis by an Assyrian woman, a sort of modern-day Rasputin." The Ministry of Health kept doctors by Brezhnev's side at all times, and Brezhnev was brought back from near-death on several occasions. At this time, most senior officers of the CPSU wanted to keep Brezhnev alive, even if such men as Mikhail Suslov, Dmitriy Ustinov and Andrei Gromyko, among others, were growing increasingly frustrated with his policies. They did not want to risk a new period of domestic turmoil that might be caused by his death. Western commentators started guessing Brezhnev's heirs apparent. The most notable candidates were Suslov and Andrei Kirilenko, who were both older than Brezhnev, and Fyodor Kulakov and Konstantin Chernenko, who were younger; Kulakov died of natural causes in 1978. Brezhnev's health worsened in the winter of 1981–82. In the meantime, the country was governed by Andrei Gromyko, Dmitriy Ustinov, Mikhail Suslov and Yuri Andropov while crucial Politburo decisions were made in his absence. While the Politburo was pondering the question of who would succeed, all signs indicated that the ailing leader was dying. The choice of the successor would have been influenced by Suslov, but he died at the age of 79 in January 1982. Andropov took Suslov's seat in the Central Committee Secretariat; by May, it became obvious that Andropov would try to make a bid for the office of the General Secretary. He, with the help of fellow KGB associates, started circulating rumors that political corruption had become worse during Brezhnev's tenure as leader, in an attempt to create an environment hostile to Brezhnev in the Politburo. Andropov's actions showed that he was not afraid of Brezhnev's wrath. Brezhnev rarely appeared in public during 1982. The Soviet government claimed that Brezhnev was not seriously ill, but admitted that he was surrounded by doctors. He suffered a severe stroke in May 1982, but refused to relinquish office. On 7 November 1982, despite his failing health, Brezhnev was present standing on Lenin's Mausoleum during the annual military parade and demonstration of workers commemorating the anniversary of the October Revolution. The event would also mark Brezhnev's final public appearance before dying three days later after suffering a heart attack. He was honored with a state funeral, which was followed with a five-day period of nationwide mourning. He was buried in the Kremlin Wall Necropolis in Red Square. National and international statesmen from around the globe attended his funeral. His wife and family attended; his daughter Galina Brezhneva outraged spectators by not appearing in sombre garb. 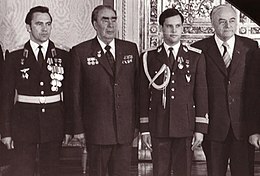 Brezhnev was dressed for burial in his Marshal uniform, along with all his medals. Brezhnev presided over the Soviet Union for longer than any other person except Joseph Stalin. He is often criticised for the prolonged Era of Stagnation, in which fundamental economic problems were ignored and the Soviet political system was allowed to decline. During Mikhail Gorbachev's tenure as leader there was an increase in criticism of the Brezhnev years, such as claims that Brezhnev followed "a fierce neo-Stalinist line". 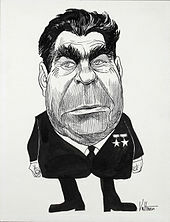 The Gorbachevian discourse blamed Brezhnev for failing to modernize the country and to change with the times, although in a later statement Gorbachev made assurances that Brezhnev was not as bad as he was made out to be, saying, "Brezhnev was nothing like the cartoon figure that is made of him now." The intervention in Afghanistan, which was one of the major decisions of his career, also significantly undermined both the international standing and the internal strength of the Soviet Union. In Brezhnev's defense, it can be said that the Soviet Union reached unprecedented and never-repeated levels of power, prestige, and internal calm under his rule. Brezhnev has fared well in opinion polls when compared to his successors and predecessors in Russia. In the West he is most commonly remembered for starting the economic stagnation that triggered the dissolution of the Soviet Union. In an opinion poll by VTsIOM in 2007 the majority of Russians chose to live during the Brezhnev era rather than any other period of 20th century Soviet history. In a Levada Center poll conducted in 2013, Brezhnev beat Vladimir Lenin as Russia's favorite leader in the 20th century with 56% approval. In another poll in 2013, Brezhnev was voted the best Russian leader of the 20th century. Brezhnev's vanity became a problem during his reign. For instance, when Moscow City Party Secretary Nikolay Yegorychev refused to sing his praises, he was shunned, forced out of local politics and given only an obscure ambassadorship. Brezhnev's main passion was driving foreign cars given to him by leaders of state from across the world. He usually drove these between his dacha and the Kremlin with, according to historian Robert Service, flagrant disregard for public safety. When visiting the United States for a summit with Nixon in 1973, he expressed a wish to drive around Washington in a Lincoln Continental that Nixon had just given him; upon being told that the Secret Service would not allow him to do this, he said "I will take the flag off the car, put on dark glasses, so they can't see my eyebrows and drive like any American would" to which Henry Kissinger replied "I have driven with you and I don't think you drive like an American!" Brezhnev lived at 26 Kutuzovsky Prospekt, Moscow. During vacations, he lived in his Gosdacha in Zavidovo. 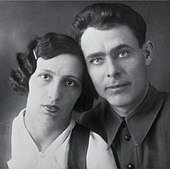 He was married to Viktoria Brezhneva (1908–1995). During her final four years she lived virtually alone, abandoned by everybody. She had suffered for a long time from diabetes and was nearly blind in her last years. He had a daughter, Galina, and a son, Yuri. His niece Lyubov Brezhneva fled to the United States and published a highly revealing memoir that shows he worked systematically to bring privileges to his family in terms of appointments, apartments, private luxury stores, private medical facilities. and immunity from prosecution. The party leadership had complete control of all the media, so there was no risk of investigative journalism exposing the corruption. This page is based on the Wikipedia article Leonid Brezhnev; it is used under the Creative Commons Attribution-ShareAlike 3.0 Unported License (CC-BY-SA). You may redistribute it, verbatim or modified, providing that you comply with the terms of the CC-BY-SA.